Springtime---> The time to Move Forward with whatever it is you say you really want. Spring represents Renewal/ Energy/ Detoxification/ Rebirth/ Optimal Health. Blackberries, Blueberries, Raspberries, Strawberries, etc… are Plump, Delicious and Packed with Antioxidants, Vitamins and, believe it or not, Minerals (especially darker ones). Berries Tone Fat Cells while Expelling Mucous. Strawberries, eaten in large doses, are known to ease pain. 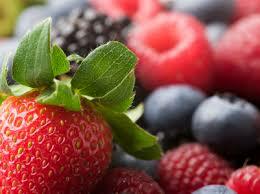 For Healthy, Glowing Skin EAT YOUR BERRIES DURING SPRINGTIME!! Berries are healing and astringent for the uterus. Eat in abundance if you suffer from FIBROIDS or just want to restore WOMB HEALTH. Enjoy berries on top of granola, oats, or all mixed up into a Sweet Spring Berry Salad. Mix a variety of berries together in large bowl. Sprinkle a dash of Cinnamon powder. Grate a smidgen of Fresh Ginger onto the mixture. Squeeze Fresh Lime Juice over the salad. Cover and Let Sit for 15-30 minutes.